By Mathini Ilancheran, principal analyst, R&D, Beroe Inc. Patient recruitment is often highlighted as the key factor in ensuring clinical study success. Ensuring on-time enrollments of patients, investigators, etc. is a constant concern throughout the clinical trial phases. However, patient retention through engagement is also a key factor — and one that is often overlooked. Patient dropout rates for pharmaceutical clinical trials are estimated to range between 15 to 40 percent of enrolled participants, depending on the trial phase. Retention of patients throughout the entire cycle of a clinical trial is vital from scientific, as well as economic, points of view. Poor retention negatively impacts the overall amount of avaluable data for regulatory submissions and increases costs for pharmaceutical companies. One strategic way in which sponsors are seeking to engage with patients is through patient health programs. The approach is considered niche in the industry, with companies providing programs based upon trial phase, therapeutic area, and disease type. What is mainly overlooked is that an effective patient retention and engagement program is a key to controlling dropout rates, and hence important to the success of a clinical trial. 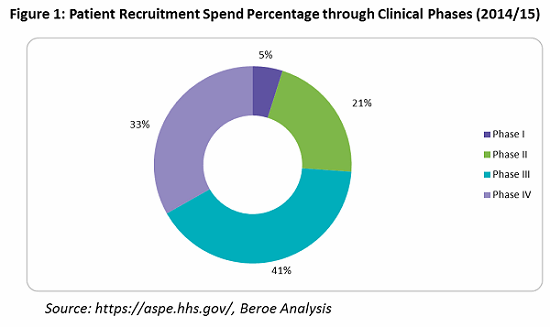 HHS indicates that an average of $76,879 is spent on patient retention (primarily through patient assistance programs) — or only 9 percent of overall trial costs. Often, these services are outsourced to service providers who can provide patient support programs such as identification and prevention, treatment and coordination, and outcome and wellness. Looking into the spend percentage through the trial phases for patient retention and engagement, approximately 74 percent of the cost goes to Phase 3 and 4 trials, followed by Phase 2 trials at 21 percent, due to the fact that more patients are enrolled in these phases (see Figure 1). Some of key parameters for patient retention are provided in Table 2. Patient understanding, incentives and reimbursement, and counselling session are the main factors largely employed by pharma companies. All the parameters in Table 2 fall under the heading of patient health (support) program services, offered by supplier. 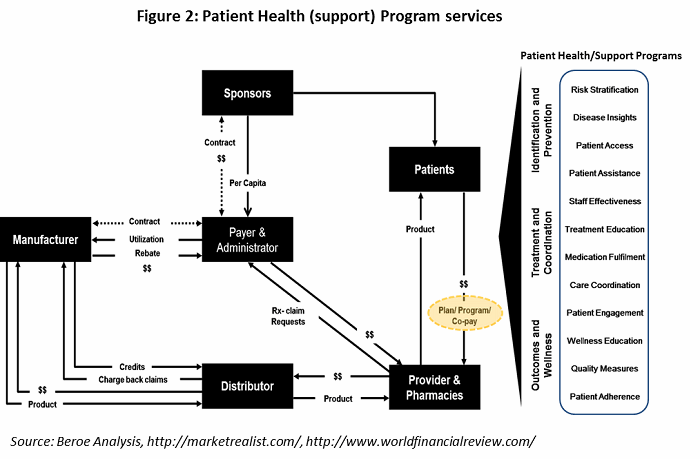 The healthcare value chain for patient health program services is shown in Figure 2, with the various support programs listed on the right. There has been a shift in the U.S. healthcare system from uninsured to underinsured, with more patients expected to obtain coverage through state healthcare exchanges. 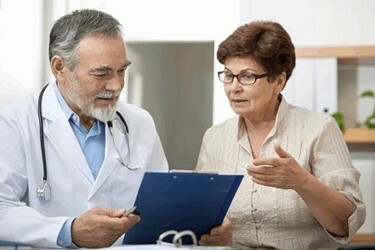 It is estimated that there will be even greater demand for services that support the underinsured.4 This will directly impact the number of patient assistance programs, causing an increase in copay and coinsurance assistance for underinsured patients.5 Within the health program space, there is a move towards making support programs more patient-managed. Most programs today still rely on paper applications, and there is an inclination among manufacturers to develop self-service web portals for patients and health care providers (HCPs) to access. As healthcare reform continues, investment in technology to replace routine tasks — such as application data entry, status updates, phone calls, etc. — is increasing, in order to reduce dependence on large call centers. At present, large contact centers are staffed with less-experienced personnel, but they ultimately will be replaced with more specialized and experienced nurses (licensed, registered), pharmacy technicians, certified billers, and coders to provide better services to HCPs and patients. As more oral and self-administered products gain investigational new drug (IND) approval, there will be an increasing need and demand for clinical call center services and technology to support patient adherence to their medications. Poor healthcare literacy adds $100 billion to $200 billion in additional healthcare expenses each year.6 An interesting method pharma is currently investigating to educate patients is through digital technologies such as medical animations, gamification, etc. These approaches enable patients to gain knowledge virtually and better retain that knowledge throughout the trial process. Suppliers are moving towards building service capabilities to provide the whole suite of patient access solutions. They are increasingly becoming partners with sponsors, providing them with strong strategic health program support and market access insight. A number of practice management and electronic medical record software vendors are working with health program support providers to develop application programming interfaces, which could further ease administration costs associated with these services. A major focus for suppliers over the next few years is building strategies to provide strong copay/coinsurance assistance services to the underinsured patient populations. 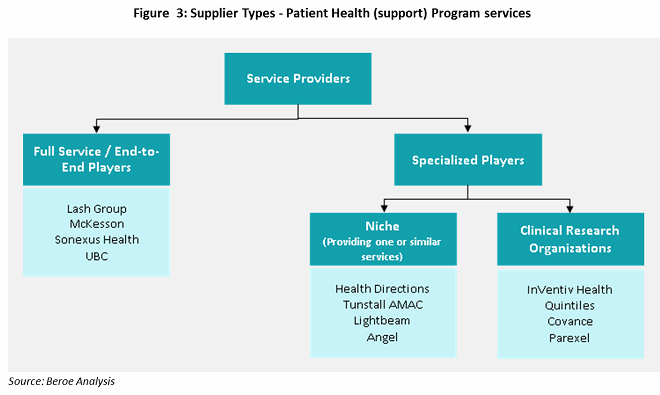 There are three main types of suppliers who can assist sponsors with patient health programs: full-service, niche players / specialists, and CROs. Full-service providers have a strong hold on pharmacy services and develop niche capabilities through mergers and acquisitions. AmerisourceBergen (Lash Group), McKesson, Cardinal Health (Sonexus Health), and Express Scripts (UBC) provide these services through specialized business unit developed or acquired over time (see Figure 3). Niche suppliers, or specialists, focus on subservices such as patient services, data analytics, quality measures, and technology support (e.g., EHR). Most niche suppliers have been developing innovative methodologies to improve patient adherence through patient support programs like digital customer relationship management (CRM), recovery logistics, and eCoupons and other rewards for adherence. These suppliers work in collaboration with other suppliers to provide bundled services. CROs have been providing health program services through various phases of clinical trials, with a focus on late-phase trials. Large CROs have developed the capability to provide patient support programs as a result of their knowledge gained through drug development, drug efficacy, and patient recruitment experience. There is a need for clinical care data to improve trials and product efficacy. Quintiles’ acquisition of Encore Health in 2014, followed by ERT’s acquisition of Exco InTouch in 2016, shows that large CROs want to develop this capability. InVentiv, Covance, Parexel, and Quintiles are the preferred suppliers in the CRO industry to engage for patient support services. Digital health technology is seen as a key enabler for increasing patient activation and continued engagement through patient engagement platforms (PEPs). The right application of digital technology can also create new opportunities for pharma companies to revamp their business models.7 Some commonly used platforms are web portals for online authorization and data acquisition and management, reporting platforms, integrated platforms with EHR/EMR systems, and end user interfaces such as social media and mobile applications. Web patient portals act as an interface between patients and their healthcare providers. Typically, drug manufacturers list all its trial drugs on the main page of its web portal. Patients can choose the trial in which they would like to participate and then proceed to a page providing specifics of the selected drug. All the data entered in the web portal by the patient is automatically captured in data repositories. In the U.S., data acquisition is dependent on patients’ and providers’ willingness to divulge information and to provide signatures and dates attesting to their approval. Reporting capabilities can show the amounts of assistance given, drug cases approved, drugs denied, and the number of inquiries received (both web and telephone based). Social media and mobile application use has been quite limited among drug manufacturers, though it is seeing increased usage as a result of digitalization. 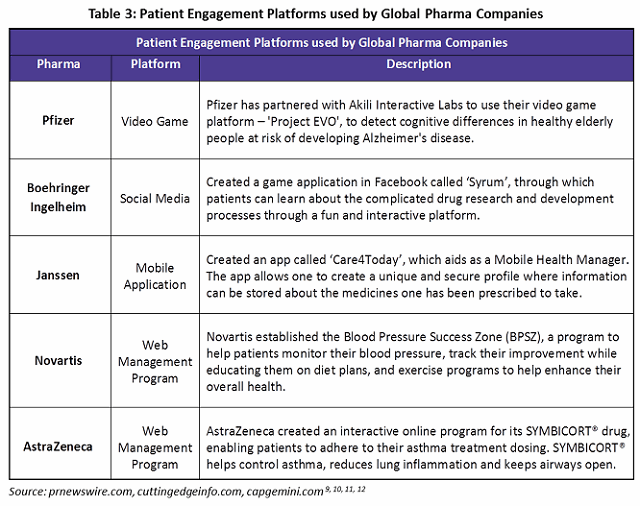 The Table 3 gives examples of digitalized patient engagement initiatives among global pharma companies. Drugdevelopment-technology.com, Clinical trial delays: America’s patient recruitment dilemma, July 2012 (accessed June 2016). B.D. Harper and D. Zuckerman, “Critical Success Factors for Planning for Site Selection and Patient Recruitment Planning,” BioExecutive International, June 2006 (accessed June 2016). U.S. Department of Health & Human Services, Examination Of Clinical Trial Costs And Barriers For Drug Development, July 2014 (accessed June 2016). ObamaCare Facts, ObamaCare | Health Insurance Exchange (accessed June 2016). N.K. Choudhry et al, “Drug Company–Sponsored Patient Assistance Programs: A Viable Safety Net?,” Health Affairs, May/June 2009, pp. 827–834. Understand.com, Understanding the Art of Medical Animation, 2015. https://www.understand.com/wp-content/themes/understand/assets/pdf/understand.com_custom-animation.pdf (accessed June 2016). A. Gupta, J. Schumacher, and S. Sinha . Digital health: A way for pharma companies to be more relevant in healthcare, Booz & Company, 2013 (accessed June 2016). T. Irizarry, A. DeVito Dabbs, and C.R. Curran, “Patient Portals and Patient Engagement: A State of the Science Review,” Journal of Medical Internet Research, Vol. 17, No. 6, June 2015, p. 148. PR Newswire, Akili Interactive Labs Announces Partnership with Pfizer to Test Video Game in People at Risk of Alzheimer's Disease, January 2014 (accessed June 2016). D. Richardson, Mobile Apps Fight Patient Non Adherance, Cutting Edge Information, Feb. 2014 (accessed June 2016). A. Bianchi, Playing Adherence Games: Not What You Think, Cutting Edge Information, Nov. 2012 (accessed June 2016). T. Forissier et al, The Next Frontier in Patient Care, Capgemini, 2011 (accessed June 2016). R. Robinson, Patient Engagement: Not Just For Physicians Anymore, PharmaVOICE, June 2015 (accessed June 2016). Mathini Ilancheran is the senior lead analyst of clinical R&D for Beroe Inc. She specializes in understanding market scenarios and industry dynamics across the globe in the outsourcing arena. She has several publications related to R&D procurement opportunities. She completed her master’s in management from University College London (UCL) and has worked as a consultant for strategic positioning projects as part of UCL advances in the U.K. She is also an engineer with a background in bioinformatics and has experience as a research fellow in Singapore-Delft Water Alliance (SDWA), NUS, with active involvement in scientific tool development and programming. You can contact her at mathini.ilancheran@beroe-inc.com or connect with her on LinkedIn.